Fermentation Support Forum • View topic - Is this mother of vinegar. Can I use it? 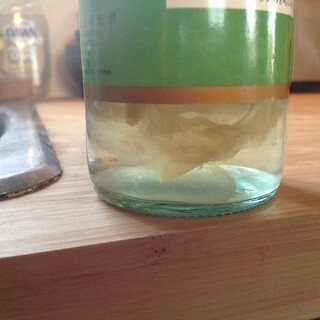 I have this interesting formation at the bottom of a rice vinegar bottle. Is this mother of vinegar? If so, could I extract it some how and use it to make wine vinegar? Re: Is this mother of vinegar. Can I use it? Update 8 months later: it was mother vinegar. I took it out of that bottle and used it to make red wine vinegar. It worked quite well. Nice! And thanks for reporting back -- we need more of that!